Lake Effect Snowfall - Best in the Midwest Riding Conditions Michigan's Western U.P. With 2000 miles of groomed trails, unplowed logging roads & national forest trails the Western U.P. offers day trips to Porcupine Mountains, Lake of the Clouds, Lake Gogebic and the Ottawa National Forest plus the best backcountry playground in the midwest. Take time to plan your route before you head out. Check maps for safe and legal spots to ride, ask where legal, protected and private property is. If trail riding, please don't go off the marked trails and never ride on private property, please. We rely on private landowners to grant use of their property for our trail system. Riders who don't follow marked trails contribute to us losing trail access and if we stay on trails, we grow the trail system over time. We want to continue with a great trail system. Local guides are a great way to get you to the best off trail spots in the U.P. that are not marked or even easy to find. It's quicker than searching and asking for info especially until you're familiar with the area. If you're interested, you'll get riding tips and if you simply want to find new areas fast, it's the best way to go. Call and we'll share what we know about local guides. Northern Wisconsin to Copper Harbor, we offer the best riding this side of the Mississippi ! Local guides know up to date snow conditions and customizes trips for each group's riding level. Crossover and Mountain Sleds recommended. Rentals available in the area (see below). Heading out on your own? ... With 2000 miles of groomed trails, unplowed logging roads & national forest trails the Western U.P. offers day trips to Porcupine Mountains, Lake of the Clouds, Lake Gogebic and through the Ottawa National Forest right out our door. Access to 2 trail is along Powderhorn Road. 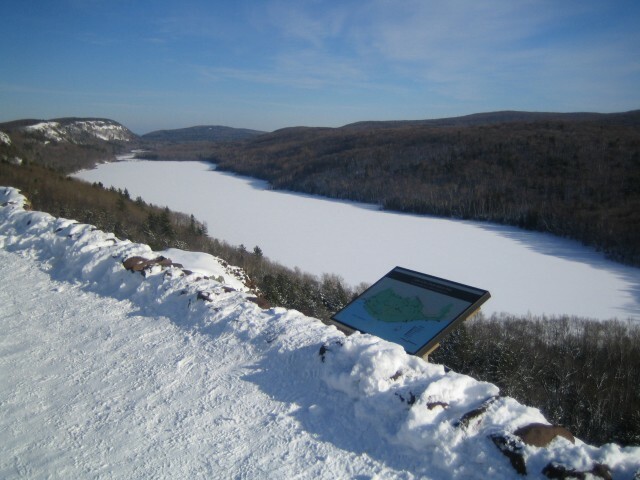 Lake of the Clouds is one of many day trips from Powder Hound Lodge.